I love hearing from SOOO many of you that you want more meditations — it really makes my heart sing! And today, I’m happy to give you more! In today’s episode of She Takes on the World TV, I’m going to share with you three very quick meditations that you can do right at your desk at any point throughout the day when you’re feeling stressed or just need to power up your productivity. These are super-easy to do, but if you do them regularly, you’ll notice a HUGE improvement in how you feel while you work! Start by taking a few deep breaths then bring your awareness to whatever is causing you stress. Then take a few deep breaths, using the exhalation to SIGH and release the tension. Once you’ve done this, shake it out and move your body, visualizing your stress being shaken away. Do this for as long as you like. Place your hands on your lap. Starting with your pinky fingers, tap one finger of each hand at a time (synchronizing your left and right hands) and move through each finger to your thumbs. Bring the flame to eye level, holding it about 12-18 inches in front of you. Set your gaze on the flame and look at it for 1-2 minutes. Take deep breaths as you do this, releasing any of the tension you may be feeling with each exhalation. Your actionable this week is to try at least one of these meditations to release stress, expand time, and reduce tension and strain so you can be productive and achieve your purpose in the world with ease. And be sure to tell me about your experience in a comment below! 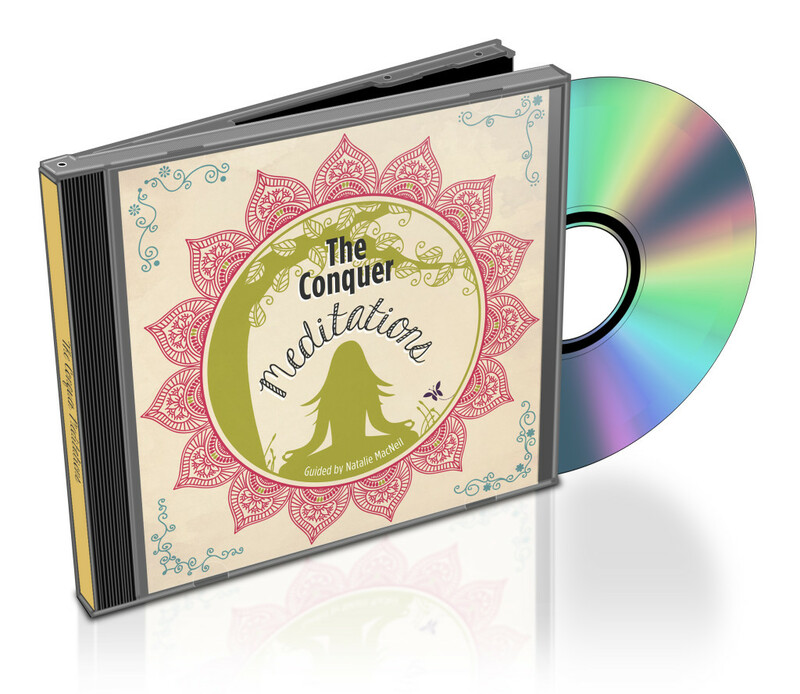 Also, check out The Conquer Meditations, a whole album of meditations that I’ve created especially for entrepreneurs like you! The guided meditations will help you work through blocks and limiting beliefs, get laser-focused on what’s most important, magnetize more of your ideal clients, power up your wealth mindset, and ultimately create an abundant business and life you love. Buy the album here. I adore your meditations! This one is no exception! Thank you! Meditation has never been so easy, so relevant, and so effective. I highly recommend buying Natalie’s meditation album. Thanks Steve, very much appreciated and I’m glad you’re enjoying the album too. Loving this Nat and your mediations have been a wonderful addition to my day (when I make room for them) and I love that they’re short and powerful. Perfect for the busy person on the go or someone newer to meditation too – they’ve been great for me! “Bring to awareness whatever is causing you stress … and say ‘I choose to see this situation differently’.” Love this. Simple yet so powerful. Will be consciously practicing this today. Thank you Natalie. Thanks Katrina! I’d love to hear how that went over the last couple weeks. Thank you so much for these, Natalie — Great ways to relax and get mindful! I think part of what makes meditation effective is the simple act of resting. Then my energy gets a little boost, and I feel like I suddenly have more time! So thanks again for re-routing my day! Awesome, I’m glad you like them. I have more coming your way soon!